This FREEBIE consists of two fun and engaging CVC Clip Cards. Children simply read the sentence beginning 'I can see a...', blend the CVC word options, clip their answers using clothespins (pegs) or paperclips, and flip the card to check their answers. Clip Flip Cards may be used as a buddy activity, as independent work or as informal assessment with an adult. 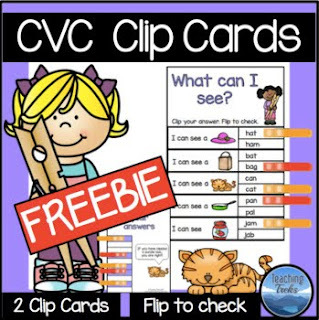 This FREEBIE is a sample of my CVC Clip Flip Cards Pack. Fact Family Family Fun: Fact Family Flip It!